Comments Off on Sometimes the sea smiles. The only way to get from Afio to Sa’a is by ship or canoe. There is a road, but the bridge just past Afio washed out several years ago. So we load ourselves and our luggage into a canoe. Solomon Islanders have been carving and paddling wooden canoes for centuries. And these canoes are still quite common. But for distance travel, everyone uses a more modern ‘canoe’. Fourteen to eighteen feet long and four to five feet wide, most canoes are made of fiberglass, have several bench seats and a covered front. They are powered by a 25 – 40 hp outboard motor and are absolutely essential for travel in this nation of islands. The sea is actually fairly rough today; a bit of chop and rather large swells. The sea was smiling, according to a local saying (when you smile people can see your white teeth, think whitecaps). The driver has to carefully adjust our speed as the canoe rides smoothly up a swell, nose in the air at the peak, and then slams down into the trough, ready to ride up the next swell. I’m glad my computer is not in the front. It wouldn’t like that pounding. Our first port of call is Liwe (lee-way) Village. 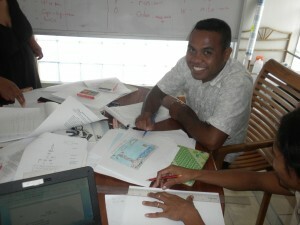 Liwe school is one of our pilot schools and we stop in to collect one of their teachers for the workshop. Turns out the Preparatory teacher cannot come because she has a young baby, so we wait while another teacher is found to take her place. We also find out that the Head Teacher, who should also attend, is at an ordination service at Waehi (why-hee) Village, across the bay. So we’re off to Waehi. We reach Waehi in the pouring rain. I am very glad for my rain jacket and pants, but am still feeling a bit damp. We wait in a “rest house” for a while for the rain to slack off and for several more teachers. Someone shows up with a parcel of pudding- so we have a snack while waiting. When everyone is ready, and it is obvious that the rain is not going to stop, we head back to the canoe. As we navigate around the next major point along the coast, it’s obvious that the conditions are a bit rough for our canoe – now with 10 passengers and our luggage. As we approach Sa’a village, there is some discussion (in the local language) as to whether or not to attempt to land. The small passage is a bit rough and would require carefully timing the waves, making a run for the shore, immediately jumping out as the canoe beaches and then quickly swinging the boat around so that the prow faces the incoming waves. A mis-timing of any of those actions could result in a wave swamping the boat, or even capsizing it. In the end, the decision is made to by-pass Sa’a and put ashore at Olosu’u, where there is a protected bay. So now we are about 40 minutes walk past Sa’a, with all of our luggage. And to make things more interesting, the recent rains have flooded the road to ankle deep in places. Fortunately for us, there is a truck available that can give us a ride. After about an hour’s wait, the truck finally arrives – though calling it a ‘truck’ is perhaps a bit generous. 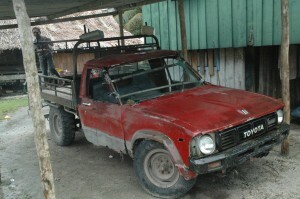 It’s a small Toyota pickup that has definitely seen better days. It lists sideways as it crawls down the road. The frame surrounding the windshield has rusted away and it’s seal is long gone. The frame is actually reinforced by some small wooden boards tied on with string. The windshield is basically just propped into place, leaving a 2 inch gap between it’s top and the pickup cab. The ground is visible through several holes in the floorboards, and the steering column has no cover on it. And of course, the body is rusted through in any number of places. But the pickup still runs. So we pile our luggage and ourselves in the back and set off down the road. We don’t break any speed records, but is sure beats walking. And it doesn’t take all that long for us to arrive in Sa’a village. In fine weather, with a lighly loaded canoe and a 40 hp engine, the trip from Afio to Sa’a takes a bit over an hour. Our journey took us six. But that’s the way it is. The Modern Conveniences are (almost) here! Comments Off on The Modern Conveniences are (almost) here! I’m afraid I left you all hanging with my last blog post. So let me continue the journey with you. Afio – government substation for the southern region of Malaita province, nestled at the southern mouth of the passage between small Malaita and the main island. The Phoenix turns up the passage at this point, by-passing the eastern side of the island and Sa’a village. So we disembark at Afio to meet up with Richard, the Chief Education Officer for Malaita Southern Region, and get a canoe to Sa’a. Richard has to attend a funeral today, so we are here until Sunday morning. There’s not much to Afio; a few government buildings, a disused market hall, and a couple of guest houses are tucked in-between the shoreline and a steep cliff. Up the hill a bit is a small hospital and a few houses for its staff. Further up are a few more houses for the substation workers, and a mobile phone tower. The guest house has screens on the windows, but nobody has informed the mosquitos of this. So I’m glad I brought my mosquito net. There is no power grid. The guest house has a small solar system and the owners also fire up a small generator occasionally when there is no town water pressure or to run the lights when it’s been cloudy. I manage to make a few calls back to Martha in Honiara, and send a few texts back and forth. But coverage is very spotty due to the steep cliff, and I have trouble maintaining a connection even when the signal is strong. Yes, the modern conveniences are coming, but it’s still a bit “hit or miss”. The ship was scheduled to leave Honiara at 6 pm yesterday and we finally got underway about 6:45. I would definitely rate this as one of the nicer trips I’ve had by ship. The sea stayed calm, with only some gentle swells. I managed to get a few hours sleep stretched out on the wooden bench. We stopped briefly at a couple of villages before dawn and then made a more lengthy stop at Kiu village. A small, protected harbour and coral sand beach made for a nice landing area. And the Phoenix sidled up to the beach and dropped the front ramp. Passengers and cargo streamed off, to be greeted by canoes waiting for cargo and a small open-air market waiting for the passengers. Feeling a bit hungry, I bought a foot-long skewer of roasted molluscs (think clams). Munching on these, I headed back to the ship. As I was finishing off the last few, a passenger offered me some ‘pudding’. I gladly took a slice, asking what kind it was. “Kakake pudding” was the reply. Kakake is a type of edible swamp taro, commonly used for this dish, and a favorite. There are several ways to make pudding, but one common method is to peel and boil the taro, then grate it and mix it with coconut milk that has been boiled down to a thicker cream. The mixture is then wrapped in banana leaves and baked in a ground oven. The result is a heavy, starchy cake, infused with and covered by coconut cream. Very rich, but tasty too. 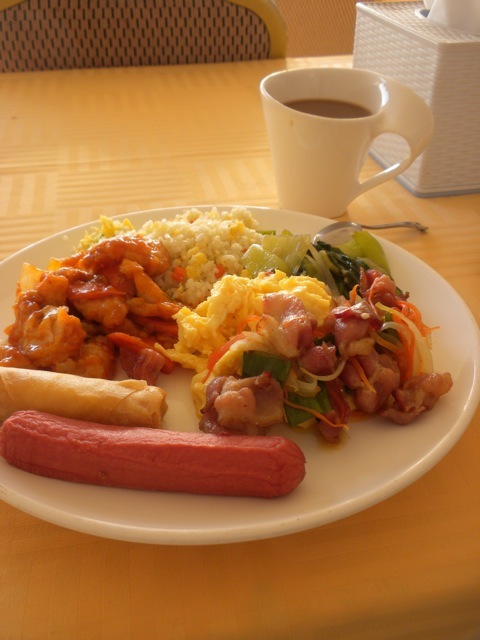 Shellfish and ‘pudding’ for breakfast – ah the islands life. Those of you who follow Martha on Facebook will know that I made a trip to one of the provinces here in the Solomons a couple of weeks ago. During that time, I was out of communications contact, except for some occasional text messages to Martha and very short phone calls. However, I did do some blogging on that trip, which I thought I’d still share, even though it’s a bit old now. Wo, remember, I’m back in Honiara now and back in the land of electronic communications. Thanks for your prayers during my journey. Well, after a long day of scurrying around I’m off to the island of Small Malaita. I’m traveling with Marion Luihenue, the Coordinator for our project, and Jonathan Soiseu, a member of the Solomon Islands Bible Translation and Literacy Partnership, and long-time Bible translation worker. The airstrip on Small Malaita has been closed for almost 10 years because of a land dispute, so the primary way to reach the island is by ship. We are on the LC Phoenix, the nicest and most reliable ship available (ironically often called ‘Phonics” by many locals). The ‘LC’ stands for “landing craft”; a type of ship with a flat bottom, open deck for heavy machinery and cargo, and a front drop ramp. A landing craft can sidle up to a beach or low wharf, drop its front ramp, and off load heavy equipment right to shore – essential for heavy construction or, more commonly here, logging. The Phoenix is exceptional in that it also has a large 3 deck passenger section. Perhaps it was a small ferry in its previous life – handling passengers and some of their vehicles. Today, it’s the best available transport for our trip. Fortunately, it’s not very crowded And the sea is relatively calm. Well, after a very full two weeks here in East Timor, which followed two weeks spent in 3 Australian locations, and two weeks before that in the Solomon Islands, it’s time for this traveler to head home. The suitcase is packed, I have a 5:30 AM taxi call at the hotel front desk, and I’m charging up my Kindle. Every stop on this trip has been different. And every stop has been strategic. Here in East Timor, I feel like I could have easily spent another two weeks, with all that is going on. The implementation team takes off in a couple of days to do teacher training in the three areas where the pilot project will be implemented. There is still material that needs to be polished up and finished. (it will probably be printed ‘as is’ and polished over the next couple of months.) But we got a lot done. And I feel that my being here made it possible for them to at least be minimally ready to start classes when the school year begins in January. I’m so glad I came. But it will be good to get home too. As with many hotels these days, the hotel where I am staying here in Dili, East Timor serves a complimentary breakfast. Now East Timor is at a crossroads between Asia, the Pacific and Australia, and the hotel restaurant is run by ethnic Chinese. So what would they serve for breakfast? Well as is typical, it’s a breakfast buffet. And there is bread (and a toaster), margarine, jam and peanut butter for those who like that. There are also corn flakes and milk. and what is supposed to substitute for sausage, which is more like a hot dog. And the coffee is excellent. With East Timor’s Portuguese heritage, they serve excellent coffee here. Over the past couple of days, the team has been working very hard to write small story books for children just learning to read. 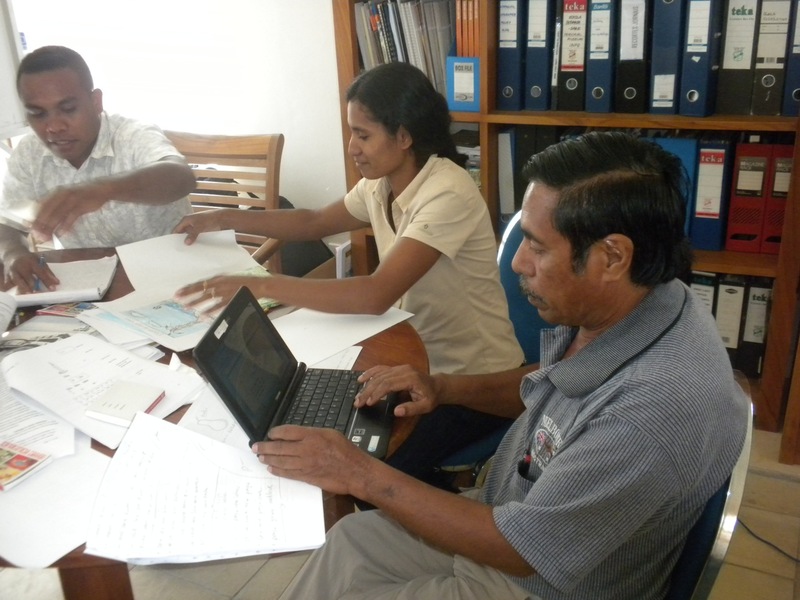 The goal is to get as many as 80 small books produced in each of the three languages of the pilot project! I have been helping them to understand more clearly what makes a good small story book, the type of story needed, the type of wording needed, the type of illustrations needed. With people from the three languages working together, they can often share story books between them, adjusting the wording or illustrations slightly to fit their specific situation. Over the past two days, they have prepared drafts of over 30 stories so far, to add to the more than 20 that they already had! On Wednesday of last week, the multilingual education team held a stakeholders meeting to report on the project so far, share implementation plans, and present important multilingual education concepts. People from various non-government organizations attended, as well as educators and representatives from the Ministry of Education. 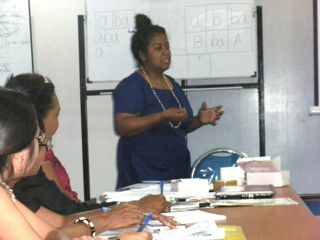 Ester explains a foundational concept to the group. I had been working with them all of Monday and Tuesday to finalize the program and help various prepare their presentations and practice them. And they all did very well. All of the presentations and conversation was held in Tetun, one of the official languages of East Timor, so I was very much the outsider for the day. I was able to have some of the discussion translated for me so I could follow some of it and occasionally contribute to the discussion. But the day very much belonged to the team. Ana does a teaching demonstration. Afterward, I heard reports that several of the participants felt they had learned a lot, saying that they had not understood before what the multilingual education program was all about. But having learned more, they now feel it is a good idea! I’ve been meeting for the past two days with the national team who is responsible for implementing the multilingual education pilot program here in East Timor. They are quality people and it has been a pleasure to work with them. Our focus these past two days has been to prepare for a stakeholders meeting that we are holding on Wednesday. At that meeting, the team will be presenting an overview of multilingual education and what has been accomplished so far in the project. 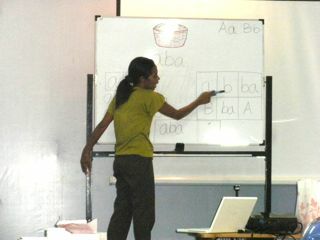 They will also present various aspects of the program, including sample lessons on literacy and 2nd language learning. It was fun to be able to help some of the team members to more fully understand how the lessons were based upon sound learning theories and to see their excitement when they understood the connections and felt like they had a more solid understanding of what they were doing. Well, I’m now on the last phase of my trip, a two week stay in East Timor. 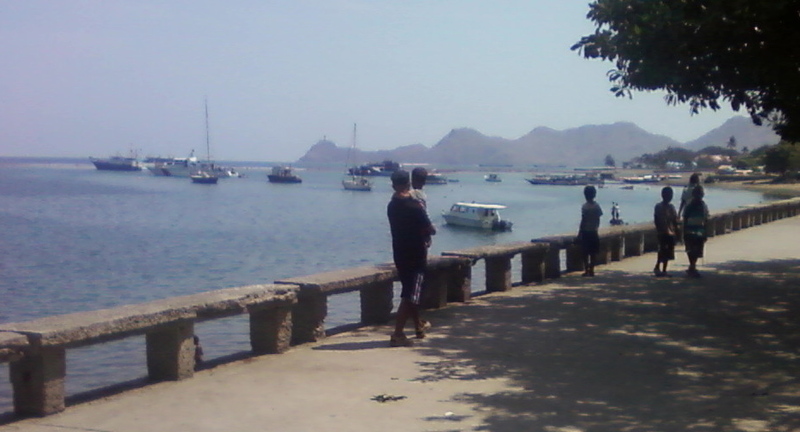 I’m in the capitol city, Dili, which as you can see is right on the coast. During my stay here, I’ll be working with a team of people from a local organization who are developing a multilingual education pilot program in three of this country’s 19 different languages. Classes are scheduled to start with the new school year in January and there is still a lot of work to do to get ready. So it is going to be a busy two weeks.